It’s been a while since my last blog post mostly because I’ve been busy with some more long form writing. Most notably, I’ve been writing a paper on the QGIS Projcessing framework in the open access ISPRS International Journal of Geo-Information together with Victor Olaya and I’m still in the process of writing a new book titled “QGIS Map Design” together with Gretchen Peterson which is scheduled for early 2016. The idea of this slide and several more was to show all the attention to detail which goes into designing a good road map. One aspect seemed particularly interesting to me since I had never considered it before: what do we communicate by our choice of line caps? The speaker argued that we need different caps for different situations, such as closed square caps at the end of a road and open flat caps when a road turns into a narrower path. So first of all, I created a small test dataset with different types of road classes. 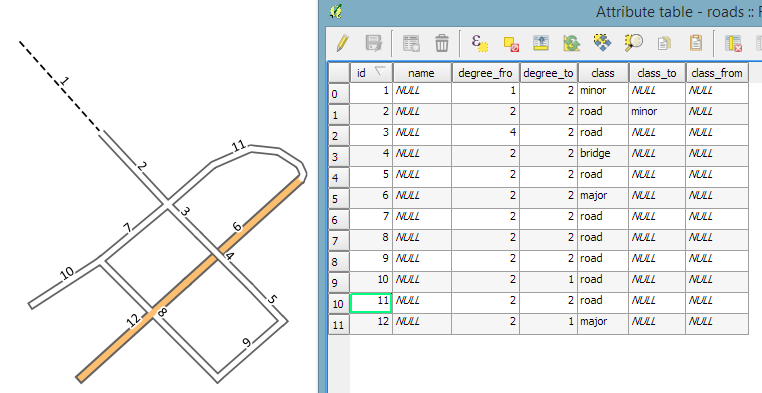 The dataset is pretty simple but the key to recreating the style is in the attributes for the road’s end node degree values (degree_fro and degree_to), the link’s road class as well as the class of the adjacent roads (class_to and class_from). The degree value simply states how many lines connect to a certain network node. So a dead end as a degree of 1, a t-shaped intersection has a degree of 3, and so on. The adjacent class columns are only filled if the a neighbor is of class minor since I don’t have a use for any other values in this example. Filling the degree and adjacent class columns is something that certainly could be automated but I haven’t looked into that yet. The layer is then styled using rules. There is one rule for each road class value. Rendering order is used to ensure that bridges are drawn on top of all other lines. Now for the juicy part: the caps are defined using a data-defined expression. The goal of the expression is to detect where a road turns into a narrow path and use a flat cap there. In all other cases, square cap should be used. Like some of you noted on Twitter after I posted the first preview, there is one issue and that is that we can only set one cap style per line and it will affect both ends of the line in the same way. In practice though, I’m not sure this will actually cause any issues in the majority of cases. I wonder if it would be possible to automate this style in a way such that it doesn’t require any precomputed attributes but instead uses some custom functions in the data-defined expressions which determine the correct style on the fly. Let me know if you try it! I can’t create a comment in the topic I really want, so, I’m writing it here. This problem is solved yet? 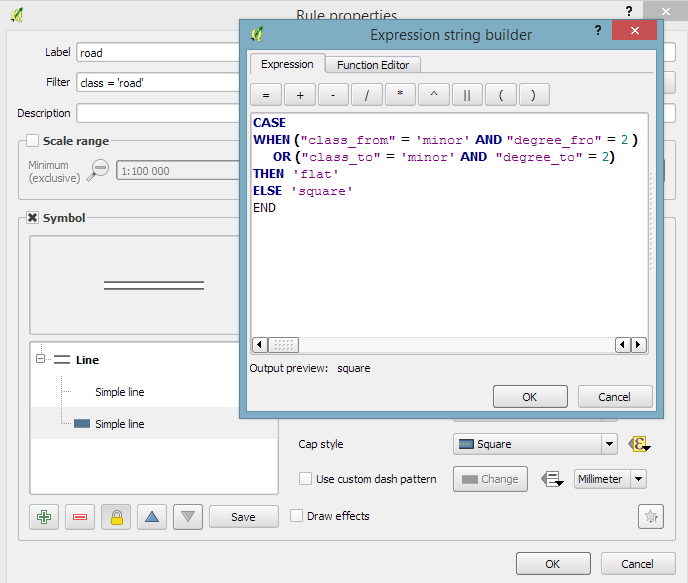 It’s been so long this topic was created, and I wonder if this is already working with a SQL Expression, like ArcGIS. Is that possible in the new QGIS versions? To label only selected features. I hope you can answer that to help me.